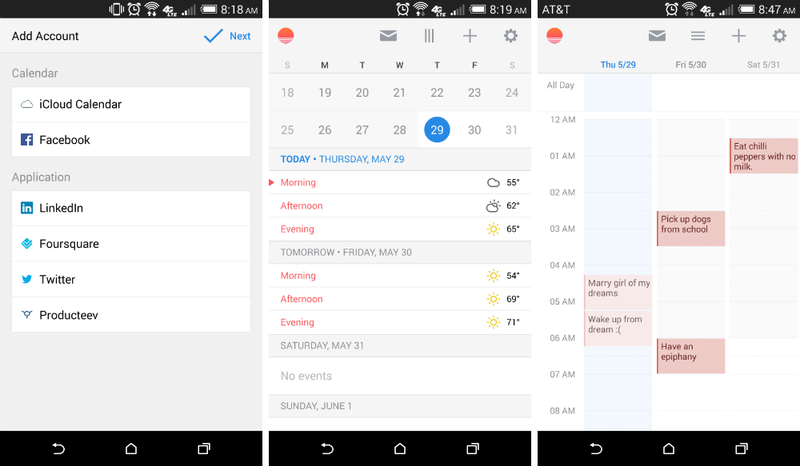 When it comes to calendar apps for Android, there are plenty to choose from on Google Play. It is easy to rely on the official Google Calendar or the one of many calendar apps that come pre-installed on any given device, but they are never all that good. Sure, they do their job, but are never all that extensive with regard to special information. Third party calendar applications allow for so much more, and the newest one to hit Google Play, called Sunrise Calendar, is worth a look. The overall UI of Sunrise is extremely clean. It reminds me somewhat of UpTo Calendar, except there are no “layers” or other event calendars to add to your schedule. Instead, Sunrise is all about displaying the times you are free. Thanks to a 3-day look, you can see just when you can squeeze in a drink with the guys or have time to hit the gym. The application also includes a widget that users can place on their home screens, plus access to adding events from other networks such as LinkedIn, Twitter, Foursquare, and Facebook. The app is free with no IAPs, so if you find yourself getting lost in your own schedule, check it out.